Hemodynamics of sudden “Toilet deaths” following STEMI ! The age old statistics , 30 % of deaths following STEMI happen even before patients reach the hospital may still be true. But ,there is an untold story that happen regularly in the rehabilitation phase .Its ironical many apparently stabilised STEMI patients still lose their life just before they get discharged or within 30 days .More often than not this happens in the toilet when they strain for defecation. At least a dozen deaths I have witnessed in the last few years. Of course we have resuscitated many near deaths as well. What exactly happens to these ill-fated patients inside the toilet ? The sudden systemic hypotension leads to fall in coronary arterial pressure proximal to the lesion. The normal physiological response to proximal fall would be corresponding distal fall maintaining the flow gradient . If the microvascular bed is damaged( loss of capacity to vasodilate ) this distal fall may not happen promptly .So its acute standstill of flow across IRA ( or even Non IRA if it has a lesion ) triggering events that rapidly destabilise unless intervened. *The opposite process , ie sudden spikes of blood pressure (In contrast to hypotension of Valsalva strain ) can occur as straining is equivalent to Isometric exercise which increase afterload .This can either cause LV failure, another episode of ACS, myocardial stretching, even tear it and result in mechanical complication. Acute LVF triggered by spikes of BP /new onset ischemic MR.
Free wall rupture and tamponade. How to anticipate and prevent these deaths ? All complicated STEMI patients should have special rehabilitation program. Finally toilet shouldn’t be locked during rehabilitation for safety purposes. All post STEMI pateints should have registered with emergency contact and alert service ready. Has primary PCI has reduced the sudden deaths in Post MI period in current era ? Please note , “discharge to 30 day mortality” following STEMI which is upto 2 % .It is the most neglected and mismanaged phase in coronary care .Toilets are definitely not a benign place for them and all the good work done by you in cath lab and CCU can be nullified in few Innocuous looking seconds ! Is Toilet room death amounts to negligence / mis-management inside hospital ? May be there is a reason for this argument. When to ambulate in complicated STEMI is a big question. ? Though we have guidelines some of the patients are reluctant to use assisted service. I think its a calculated risk , and there is trade off between the benefits of early ambulation and potential exertion related risk. T waves attract less attention in STEMI ,except for the fact tall T waves implies hyper acute phase of STEMI. What is the duration of hyper acute phase ? No one exactly knows .It can be highly variable . So , 5 could be the correct answer . * Most importantly hyper acute phase need not occur in all patients with STEMI as suggested in experimental models. It is the pottsium channel dynamics.Transient intracellular hyperkalemia is thought to be responsible. This sort of T wave behavior makes it difficult to diagnose STEMI.Enzymes will help , still thrombolytic guidelines demand us to wait till ST elevation to occur. This is unfortunate .But as physicians we are justified to thrombolyse tall T waves with a clinical ACS .The other simple solution is to shift the patient to cath lab to find what exactly is happening in the LAD ! Now , what is new about T waves in STEMI ? A tall persistent hyper acute T wave helps us to localise a LAD lesion .This paper from Netherlands , clearly confirms this observation. The study was done from a primary PCI cohort, a perfect setting to assess the T wave behavior in the early minutes /hours of STEMI . Does hyperacute T waves occur in infero-posterior STEMI ? I would believe it is very rare .Our CCU has not seen any tall T waves in inferior lead. Further analysis of the data from the above study could answer this question . How often a hyperacute T waves transform into NSTEMI ? This again is not clear.Most of the hyper acute T will evolve as STEMI .But , nothing prevents it to evolve as NSTEMI a well . After all , a hyper acute T MI can spontaneously lyse in a lucky few , ( Who has that critical mass of natural circulating TPA ) .If these natural lytic forces are only partially successful , it may evolve into de nova NSTEMI. Bi-phasic T waves in ACS. A benign looking T waves with terminal negativity in precordial leads can some times be a deadly marker of critical LAD disease.This has been notorious to cause deaths in young men which often correlates with the widow maker lesion in LAD. What is a slowly evolving STEMI ? Prolonged tall T wave phase possibly indicate , the myocardium is relatively resistant to hypoxic damage . 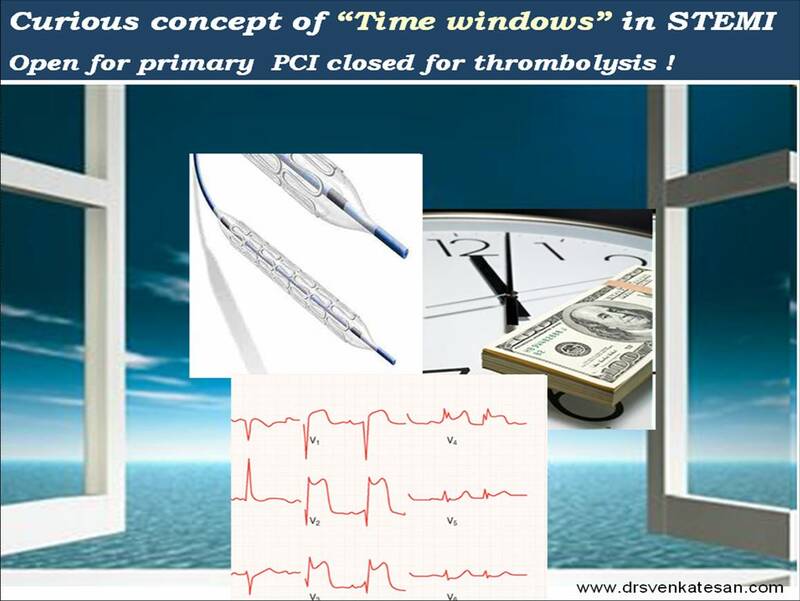 The most bizarre aspect in our understanding about ACS pathophysiology is the concept of time window , based on which , all our ACS therapeutics revolve ! Does all myocardial cells have a same ischemic shelf life ? Can some patients be blessed with resistant myocardial cells when confronted with hypoxia or ischemia ? It is well-known , in some hearts , the muscles go for necrosis within 30 minutes of ischemia, while some hearts can not be infarcted even after 24 hours of occlusion .So , slowly evolving STEMI is a feature of myocardial ischemic resistance .This is not a new phenomenon as we have extensively studied about the concept ischemic preconditioning . We wonder there is something more to it . . . the quantum of preconditioning can be inherited .Further , we are grossly ignorant about the molecular secrets of non ischemic metabolic preconditioning . Do not ignore T waves in STEMI. It has more hidden electrophysiological treasures that is waiting to be explored . Essential nephrology for cardiologist : A new molecule scores over creatinine in predicting acute kidney injury ! Bio-chemical diagnosis of cardiac injury or infarction is well documented modality for many decades. 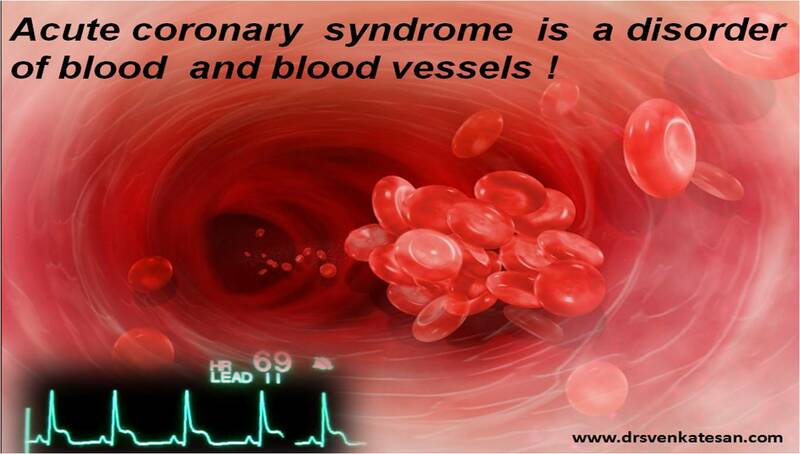 Now , acute coronary syndrome is diagnosed by a battery of tests that detects the proteins leaking from the injured myocardium. This is 25 Dalton molecule richly secreted within renal cortical cells in response to ischemic injury . It is released without modification in the urine .High urinary levels of NGAL reflect acute renal injury. Early experience shows it is a promising investigation and could become a regular biochemical test in the near future. Urine level of NGAL >250 ng/ml , 2 hours after cardiac surgery predicts impending renal failure in the next 24-48 hours .The advantage is , it NGAL raises well before serum creatinine. Bachorzewska-Gajewska H et al. Neutrophil-gelatinase-associated lipocalin and renal function after percutaneous coronary interventions. Am J Nephrol 2006; 26: 287-292. Cardiologists and cardiac surgeons have started performing complex PCIs and CABGs in patients with delicately and precariously balanced renal function. While , cardiologists challenge the kidneys with high osmolar contrast agents , the surgeons stress it with extra corporeal circulation. Many of these patients also have co- morbid conditions . Often , the cardiac outcome is directly linked to pre /post procedural renal function .Nephrologists usually arrive late into the filed (Creatinine SOS calls ! ).By this time the full-blown ATN sets in many. Now , we have a tool to identify impending ARF , it gives us little more time and flexibility in managing the issue . Rare skills in medicine : Diagnosing stroke with the help of electrocardiogram ! 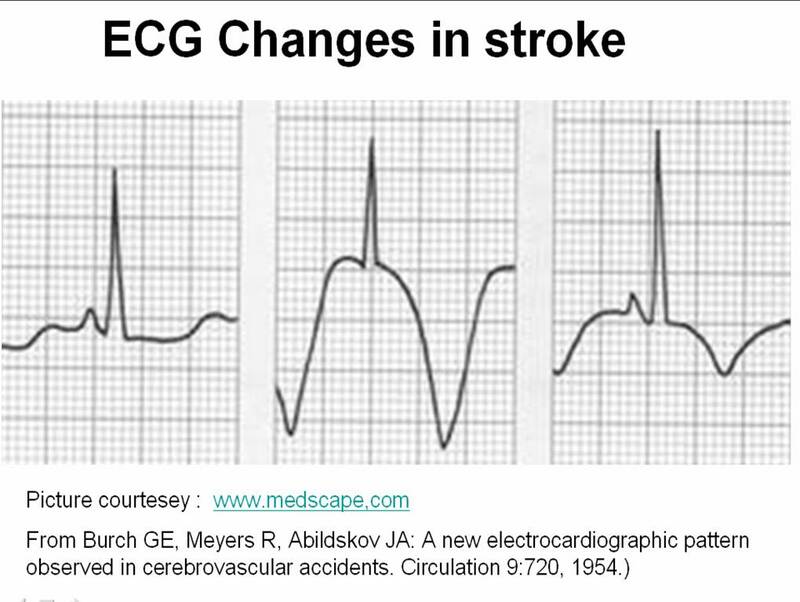 Let us travel intime and go to the year 1954 . . .
Three physicians from Michigan ,USA published one of greatest observation in clinical sciences , namely the ECG changes in various forms of stroke . Now , a shrewd physician , will suspect a subarachnoid hemorrhage (SAH) by looking at the ECG when the clinical situation demands . But , what we need is every one should develop that skill . We have seen errors happening even in big institutions (or is it because it is big ?) when an elderly person comes with deep T inversions with or without altered sensorium being rushed into CCUs & cath labs instead of neurology units. We need to teach our junior colleagues . . . That , ECGs of patients with acute neurological syndromes (ANS) can mimic as acute coronary syndromes (ACS) ( especially in elderly ) . The ECG changes tend to occur very early after CNS injury.May last up to 1 week. They are not useful to identify the type of stroke. But , deep T wave inversions strongly suggest SAH rather than ICH or thrombotic stroke. What is the mechanism of these ECG changes ? It is a clear proof that heart and brain are interconnected by neural network. All the noted changes occur during myocardial repolarisation . (ie ST segment ) The current thinking is (Ofcourse , it is same as our thinking in 1950s !) it is mediated by adreneergic surge initiated by CNS insult transmitted to myocardium by the sympathetic system. Why should SAH produce more ECG changes than others ? It is possible the net adrenegic drive from the brainstem and spinal cord will be greater in SAH as it spreads the entire CNS through the cerbro spinal fluid. While localised ICH and infarct is likely to generate less adrenergic impulse. This came 50 years ago , we still quote their work and no one has improved their work . If only we make the clinical bed side teaching as a regualr habit , we do justice to our great physicians of the past , who enriched our life with their clinical skills and passion for knowledge sharing .